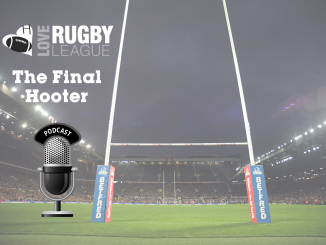 Ben Roberts is the perfect on-field epitome of Super League; unquestionably talented, highly entertaining and prone to mistakes – his inconsistency can make him as frustrating as he is captivating. In the final, astonishing minute at the Hose on Thursday, he was all of those wrapped into one. 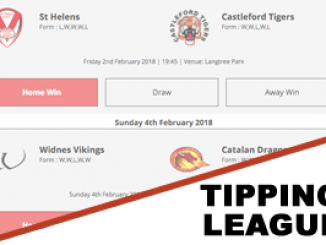 An error almost under his own posts, miss-fielding a high kick, seemed to have denied Cas the chance of their first win against Saints since 2008, the sides tied at 24-all. The never-say-die spirit engendered which, more than anything, seems to be the calling card of Tigers coach Daryl Powell, somehow retrieved the situation from the ensuing scrum and, un-phased, Roberts produced a delicious cut out pass to send winger Denny Solomona into counterpunch territory. Liam Finn showed extreme calm to take the right option of a tackle to enable one more play as the hooter was about to sound and Roberts did the rest, snapping over a drop goal with his left foot, despite a bearing-down defence, to send the already fervent Tigers fans into cumulative ecstasy – Caroline has barely been so sweet. It was golden point in normal time and rather than look too deeply into quality thresholds, we should just enjoy it for what it was; the true essence of sporting drama and, astonishingly, North Queensland did exactly the same the next day. If we can’t sell the game to the neutral or corporate on the back of such astonishing performances and outcomes then we never will. On consecutive weeks, Powell’s men have toppled the then league leaders and, even though there is a general air of unpredictability in the competition, they look to have the most favourable run in to the Super 8s split; being out the Cup might also be a further boon in such a long league season. While the jigsaw pieces seem to be coming together for the Tigers, “Belief is growing all the time and we’ve gone to another level defensively,” said a beaming Powell afterwards, Warrington – who appear to have the toughest remaining fixtures prior to the split – seem like a bag of misfits. The Wolves did, though, carry out the best business, re-signing young star Ben Currie on an improved four year deal until 2019. That is the other side of the marquee ruling, the ability for clubs to retain their best, young players in the face of the NRL poachers, who were after him en masse. 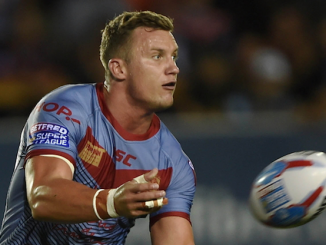 Losing Josh Jones to Exeter rugby union is a blow but part-compensated by the return of Krisnan Inu, who made a try scoring debut for Catalans against a Wakefield side that has already moved from being a 40 to a 60 minute team under Brian Smith. Not all captures have to be perceived topliners in order to add value, Denny Solomona being a classic Cas in point. The young, raw winger is perfect Powell material, a thrill machine – as he showed with his exceptional long range, first half try against Saints – with seemingly unlimited potential that the Tigers coach is so adept at releasing. His ability to get bums off seats is comparable with fellow exciter, Kieran Dixon as he showed again when racing away just after the break to help Hull KR on their way to a notable post-Campese win. Albert Kelly was commanding in the absence of the master, especially on defence, and Kris Welham cameoing exactly what it means to put your body on the line, his collision with Joel Monaghan to set up Josh Mantellato for a try without any vestige for self-preservation. What Solomona and Dixon share is that that they came through the ranks of London Broncos, whose value to the sport has been frequently questioned over their last 35, nomadic years – and how good was it to see the plethora of different shirts paraded at the Hive on Sunday as the club celebrated its heritage day. 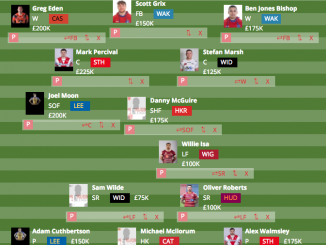 Imagine this side representing them in Super League: Kieran Dixon, Denny Solomona, Dan Sarginson, Mason Caton-Brown, Michael Channing, Luke Dorn, Luke Gale, Matt Cook, Scott Moore, Tony Clubb, Atelea Vea, Mike McMeekan, Louie McCarthy-Scarsbrook – all brought through in the capital, currently holding down a Super League place at other clubs, and more than likely capable of a top eight place. 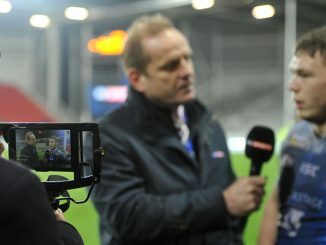 It gives even more credence to why Wigan would want to establish a foothold in London, not just commercially in terms of raising the profile of their brand in order to attract new fans and corporate partners, but because there is such a reservoir of comparatively cheap talent in the region to tap in to as well. The Warriors’ efforts to expand their business is part of a concerted effort to change the face of rugby league worldwide in what could be the most exciting developments since the ‘All Golds’ arrived in 1907 and took the sport back to the Antipodes. State of Origin is looking to expand its geographical spread after securing a record crowd in Melbourne for the New South Wales revival. The NRL have confirmed that every third year a game will be held on neutral territory with Perth and Auckland already in the running and London possible. Twelve of their sides have currently expressed interest in being part of the 2016 World Club Series here as opposed to the pioneering three last year, giving the domestic-international scene setter an instant boost that will, surely, help attract global sponsors. It seems increasingly likely that a World Cup group will be hosted in Papua New Guinea for the first time in the 2017 tournament, which will be a huge fillip in a country that lives and breathes league and comes on the back of the success of the PNG Hunters in the Queensland Cup. And Toulouse will add a continental element to League 1 next season which, whether it seems slightly self-defeating at that level, at least enshrines the principle and integrity of bringing back promotion. Maybe these developments are the start of a real #newera for the sport. What overshadows them, however, is the devastating news overnight of the passing of Sunshine Coast Falcons forward James Ackerman after suffering a fatal head blow in an Intrust Cup game near Brisbane, a most terrible tragedy in one of the most beautiful parts of the rugby world. Former St Helens player, now chief executive of the Falcons, Chris Flannery, described Ackerman as a “champion guy” and “one of our leaders” – qualities we so admire in all those who don the shirts we follow. “He lived for rugby league. He was a tough competitor and a fine player who in many ways was the heart and soul of our team. James loved the game of rugby league, he always played the game with his heart on his sleeve,” Flannery added. While the whole sport rallied round for Danny Jones from all corners it is played – and there is a Supporters Forum event at Hunslet on Thursday evening for that cause for those interested – hopefully it will do likewise for James’s family and young children. A Facebook page called ‘Support for Ackers #8’ has been set up. The broadest smiles and longest hangovers are still in Castleford the morning after.